Netaji would have been 122 years old today (Jan 23rd, 2019). While suave marketing over many years credits India’s freedom to Ahimsa – the truth may be very different. In an interview given to BBC in February 1955, B.R.Ambedkar explained the reason for the exit of the British in 1947. Netaji Subhash Chandra Bose and his INA had caused enough damage to the British. Clement Attlee then Prime Minister of Britain agreed Netaji was the hardest challenge for them. Several intelligence and defence experts reiterated the same. But this is not a political write up on Netaji and many more like him who worked tirelessly for India’s freedom but are relegated to the footnote of history. This Blog is about the origin of the energising salutation “Jai Hind” and how a member in Netaji’s INA helped coin it. Netaji Subhash Chandra Bose was in Germany in 1941. he was trying to recruit Indian soldiers captured by Nazi Germany into his Azad Hind Fauj. 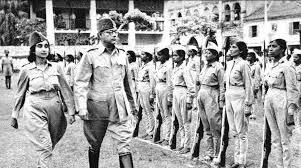 A nationalist to the core who wanted a United India, Netaji observed that even in the German POW camp Indian soldiers grouped together in their own ethnic , religious groups. The Indian army then ( and now) was formed on the basis of ethnic lines – The Rajputs, Sikhs, Madras regiment, Baluch’s etc. When they met they greeted themselves in their own salutation – “Namaste or Sat Sri Akal, Ram Ram Ji or Salaam Alaikum”. This worried Netaji and he realised that the first step was to replace the religious greetings with a common salutation that was acceptable to all and would be the foundation to uniting and integrating the INA. But what troubled him was that the soldiers of the Indian Army had historically been organised into regiments based on ethnic and religious lines – the Rajputs, the Baluchis, the Sikhs, and so on. And even here, in the prisoner-of-war camps, they tended to cluster into their own little ethnic and religious groups. This job was accomplished by his trusted aide – Abid Hasan. Born to an anti-colonialist family in Hyderabad, Abid Hasan was brought-up in India and later went to Germany to train as an engineer. It was while he was a student during World War II that he met Netaji in 1941 who motivated him to drop out of engineering college to became his aide. Tasked with the job of creating a unifying salutation his first version was “Jai Hindustan ki” when he overheard two Rajput soldiers greet each other with “Jai Ramji ki”. This was later modified to the shorter, more rousing “Jai Hind”. Did the Nazi salutation of Hell Hitler have anything to do with this – One can only surmise. Netaji was delighted with Hasan’s idea, which worked so well that “Jai Hind” soon went beyond its original brief to become a rallying cry of the Indian National Army. Later, of course, it would be adopted as the national slogan when, at the time of Independence, Jawaharlal Nehru raised it at the Red Fort. It is ironic now, in the time of the Bharat Mata ki Jai controversy, to think that Jai Hind was a slogan created specifically to help unite the people of India, rather than divide them. So what became of Abid Hasan? When Netaji travelled from from Germany to Japan by submarine in 1943, he took Hasan along with him. The journey took 4 months. Beginning in the Baltic Sea in a German submarine, transferring off the coast of Madagascar into a Japanese submarine, and then sailing across the Indian Ocean to land in Sumatra. (This voyage that is interestingly portrayed in Shyam Benegal’s The Forgotten Hero, with Rajit Kapur playing the part of Hasan). From Sumatra the two of them were then flown in a Japanese Air Force plane to Tokyo. Hasan (by then Major Hasan) fought in the historic Battle of Imphal in 1944 – which Netaji believed would be the INA’s great breakthrough into the plains of India at the head of General Mutaguchi’s 15th Japanese Division, culminating in his dream of “Chalo Dilli!” But, unfortunately, everything went wrong. The four-month-long Battle of Imphal (along with the Battle of Kohima nearby) has been voted the greatest battle fought in the history of the British Army. But what that meant for the Indian National Army was that instead of leading to an advance upon Delhi, the battle ended with the long, dejected retreat back to Rangoon, which Hasan orchestrated. he was imprisioned by the British and grilled for the whereabouts of Netaji. he revealed nothing. After independence Abid Hasan was released following the end of the INA Trials in 1946 and joined the Indian National Congress briefly. Post partition, Hasan chose to settle in Hyderabad and joined the IFS. Over a long diplomatic career, Hasan served as the Ambassador to a number of countries including Egypt & Denmark before retiring in 1969 and settling back in Hyderabad. Abid Hasan Saffrani died in 1984.